CETE Automotive has brought their super popular air suspension controller to the new Q5 and SQ5 models! With this active suspension control module you have the opportunity to use the full range of your air suspension and control it according to your wishes for each drive select mode and beyond. Since the new updated system uses Bluetooth to connect to a smartphone app no switching wifi networks is needed to access the controller. No additional buttons need to be fitted to the interior of the car and installation is discrete. 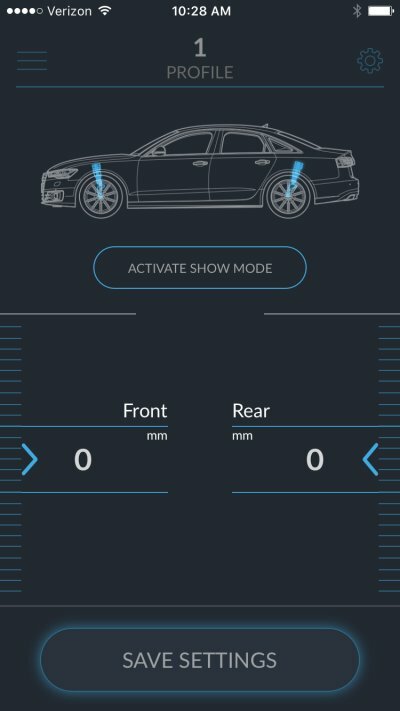 The show mode function allows the car to be lowered to the maximum level with the touch of button in the smartphone app. The full drive select system stays intact along with all other wireless and Bluetooth functions within the car. Works with all Q5 and SQ5 MkII models that have factory fitted air suspension! Last edited by [email protected]; 02-11-2019 at 08:53 AM. Could you clarify exactly what you are looking for? The way the controller works is that it allows you with a smartphone app to change the height of each drive select mode individually and the controller will remember that height each time you select the individual drive select modes. This means if you want the dynamic drive select mode to be lower than it is from the factory you can set that with the app and every time you select dynamic the car will go that height you've set. You can always go back into the app and change the height setting any time for any of the drive select modes. If you want to leave one, two or more of the drive select modes at factory ride height you can. You can also lift settings if you like, super configurable. You don't need to use the smartphone app unless you want to change the set ride height in a drive select mode or if you want to use the show mode. Hopefully that answers your question, if not do let me know a bit more and I can very likely get you the info you need. [[email protected];25275067]Could you clarify exactly what you are looking for? What I'm looking to do is use Individual mode as a drive mode where the car rides just 13mm lower than it does in Dynamic. So if I go back and select Dynamic drive mode, the suspension actually goes up from Individual mode. Individual mode is a combination of other drive select modes for multiple items beyond suspension. It is not it's own suspension drive select mode. That does mean that you cannot make the individual drive select mode into a new unique suspension setting. This controller does not add new drive select modes, it alters existing drive select suspension modes. You have the choice of altering the dynamic lower, raising the offroad and leaving all others at factory ride heights. You can lower every drive select setting, raise, whatever you want within reason. Thanks for the info that does answer my question. So I really don't want to lower Dynamic because that's engineered to work on most roads most of the time to be sporty without danger of bottoming. I want to be lower for a specific 10 mile twisty stretch I travel regularly that just got repaved and is silky smooth. I know the extra lowering will feel great for that but still want to use regular Dynamic at other times. So now I'm wondering what the Auto drive mode would do....if I put the gearshift into sport mode and start cornering hard in the twisties, if Auto mode has sensors that would stiffen the damping automatically then it seems I could still benefit that way if I can lower the car just for Auto mode. Anybody know of a resource where they describe what changes are actually made in the different drive modes? If you change the ride height setting in dynamic (-10mm) with this module whenever dynamic is selected, whether by you or by the Auto drive select mode (or individual mode) the car will always be -10mm. For what you want to do you can use the app quickly to change the ride height on dynamic. If you were driving and decided to take a little twistier route, set car to dynamic (or use individual with suspension in dynamic), open the air suspension controller app on your phone (obviously while stopped for safety), use the roller to set -10mm (or whatever you prefer) and go for it. When you are done with the twisties and want dynamic mode at stock height pop open the app and set the rollers to zero. 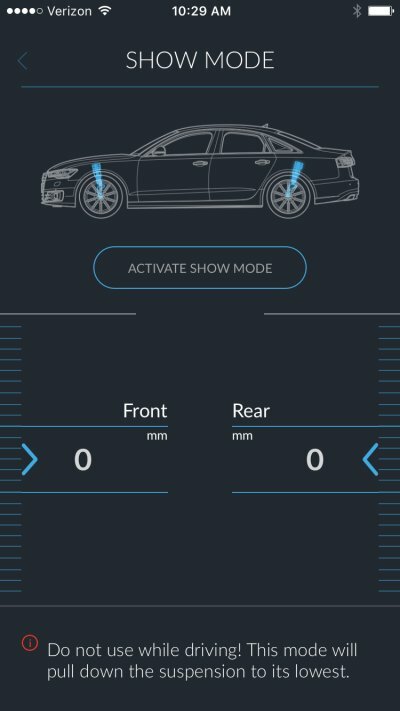 If you select a lowered ride height for the auto drive select mode then whatever suspension mode the car decides to use for your current driving style will be lowered by the amount you set in the app. If the car selects dynamic it will be lowered by your specific amount, if the car selects comfort it will be lowered by your specific amount, etc. With the ride height clearance that these models already have -10mm on dynamic as a setting I can't imagine would ever cause any issue with clearance and definitely not with ride. You can then leave comfort alone and lift the offroad setting for tons of clearance if you like. 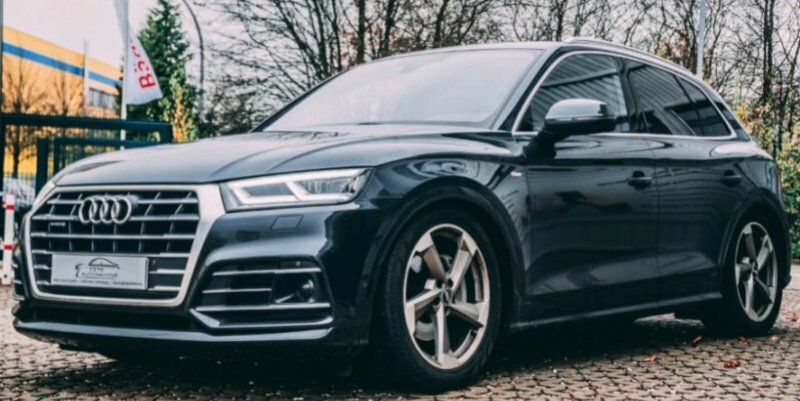 Can't wait to see some Q5 and SQ5 models rocking show mode and showing how versatile these setups make the air suspension.